Having grown up in Florida, I have many fond memories that center around strawberries. Each weekend during strawberry season, my family and I would drive 30 minutes to Plant City, famed for its sweet, red berries. We would happily wait in line at Parksdale Farms, along with nearly half the town, just to taste some of their famous strawberry shortcake. This cocktail recipe highlights strawberries in two ways—fresh, and in a shrub (or drinking vinegar). The shrub adds a nice, vinegary kick to a traditional Pimm’s Cup cocktail. Using a vegetable peeler, slice a long ribbon of cucumber and line a tall cocktail glass with it. Carefully fill glass with ice. In a cocktail shaker, muddle cucumber slices and mint leaves. Add ice, Pimm’s No. 1, strawberry shrub, and blood orange liqueur. Shake until frothy and strain into prepared cocktail glass. 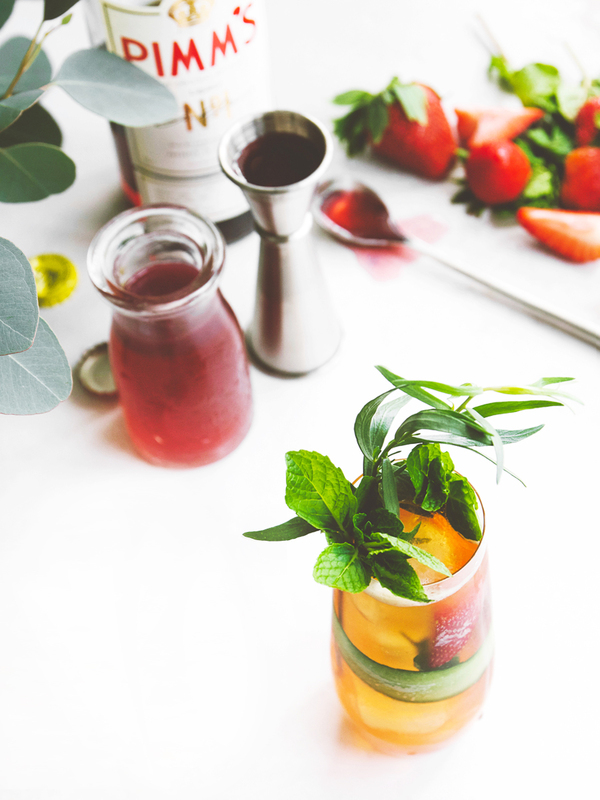 Top with ginger ale and garnish with fresh mint, tarragon, strawberries, and lemon. In a medium bowl, add strawberries, lemon zest, and sugar. Using a cocktail muddler or back of a spoon, muddle strawberries, extracting as much juice as possible. Cover with plastic wrap and store in refrigerator for 24 hours, stirring mixture occasionally. After 24 hours, pour mixture through a chinois or fine-mesh strainer into a small bowl, pressing berries to squeeze out as much liquid as possible. Add apple cider vinegar to strawberry mixture, whisking until any undissolved sugar is incorporated. Pour vinegar mixture into a clean mason jar, cover with a lid, and store in refrigerator for 1 week, shaking occasionally, so that flavors have time to blend. cook’s note: Use remaining shrub to season salads, flavor soda water, add a little zest to marinades, and, of course, add a sweet-sour note to other cocktails.